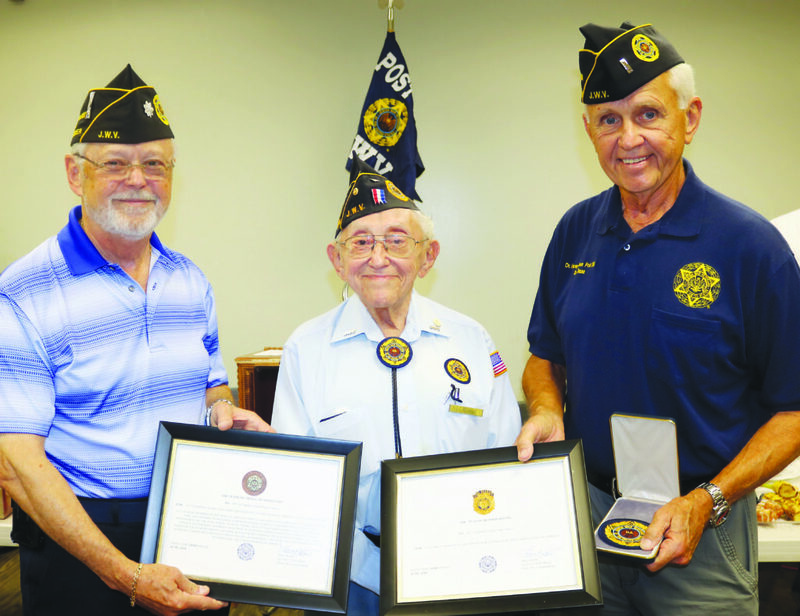 Post Commander Steve Krant, left, and Sr. Vice Commander Jim Walsh, right, flank Sol Wald and hold his citations and Supreme Medal of Merit coin. Sol Wald, a spry 98-year-old World War II veteran and longtime (55+ years) member of the Dr. Harvey J. Bloom Post 256, Jewish War Veterans of the USA, was honored for his many contributions to the local and national organization at the Post’s monthly Bagels & Lox breakfast at the JCC on June 24. Sol, a former National Deputy Americanism chairman, led the gathering with a strong and proud voice in reciting the Pledge of Allegiance to open the meeting. He was presented with JWV’s “Supreme Medal of Merit Coin” for his years of dedicated service to his community as well as the Post. Many of his durable designs and devices — from bolo ties and pocket emblems to Poppy Drive stands and storage lockers — are still in use today. Daughter Janice and sons David and Edwin attended the award presentation; Janice and Edwin came from out of town.